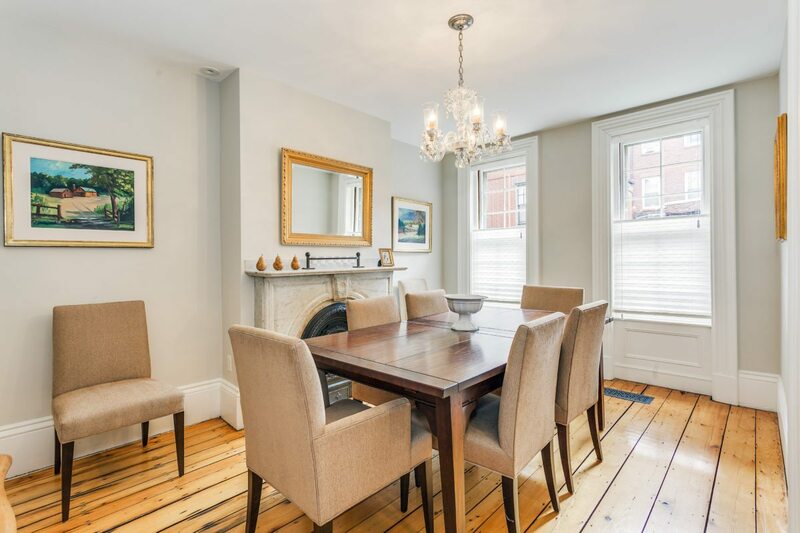 Impressive Italianate Victorian Brick Single Family Townhouse! Prime Location! Just off Monument Square! Circa 1853! 2900SF! 3 Bedrooms, 2 Full & 2 half Baths! Glorious East & West Sun! Impeccably Maintained and Updated by current owners! Graceful Entrance Foyer with Sweeping Period Staircase! Gleaming Pumpkin Pine Floors are Everywhere! Lovely Formal Dining Room with Carved Carrara Marble Ornamental Fireplace! Full Butler’s servery with wine cooler, refrigerator & wet bar! Elegant Living Room with Custom Built In Shelving & Cabinetry, Wainscoting and Raised panels under Windows! Period Fireplace Mantel! Enormous Chef’s Dream Kitchen with Built In banquette seating, Sparkling New Counter tops, Refinished Cabinetry and top of the line Thermador Stainless Steel Appliances! Charming Brick accent Wall & Large Walk in shelved Pantry! Limestone tile heated floors! Direct Access to a serene Brick & Cobblestone English Courtyard for Memorable Outdoor Enjoyment! Second Floor Boasts a Warm & Wonderful Fireplaced Family Room with Bookcase lined Walls, Cabinets and an inviting Bay Window seat! Perfect Monument Views! Outstanding Master Bedroom with Towering Ceilings & Newly Customized California Closets! Sensational Custom Bath with Carrara Marble Herringbone Floors, Double Vanity & Tub Surround! 2 Additional Oversized Bedrooms and Full Bath! So many amenities and upgrades including new multi zoned heating system! High Velocity Central Air! Renovated Laundry & Storage Room! One of the Most Remarkable Homes in the Entire City!